Compare DAL222 to other loran receivers. Its uncluttered panel tells the story: no gain controls, no attenuators or level meters, no drift controls, no AFC or interference reducer switches. It's fully automatic. Just turn it on and select the two desired stations. Signal acquisition, sweep synchronization, gain adjustments, noise filtering.. .all operations required for two LOP readouts are done automatically. Initial acquisition time for both LOP's is about 20 seconds. Each is subsequently upgraded every 31/2 seconds. The U.S. Coast Guard recently announced that it would keep Loran A stations operating. For good reasons. No other system offers such dependable navigation at such modest equipment costs. DAL222 offers advanced solid-state circuits that minimize interference from atmospheric noise and random radiation. Groundwave range is extended. Night-time skywave reception is improved. DAL222 has a unique memory circuit which can freeze a fix for later reference or log entry. Exceptionally light and compact, DAL222 mounts al most anywhere—table top, overhead, console, bulkhead, vertically or horizontally Optional accessories include a weatherproof remote dual display unit and a specially tuned 8-foot Loran antenna. The completely solid-state DAL222 has plug-in modular circuit boards and integrated circuitry for maximum reliability. If it should need service, you can depend on any of our 100 nationwide ITT Decca dealers.They'll come aboard and have you underway quickly. New York, N.Y 10016, (212) 685-5157. 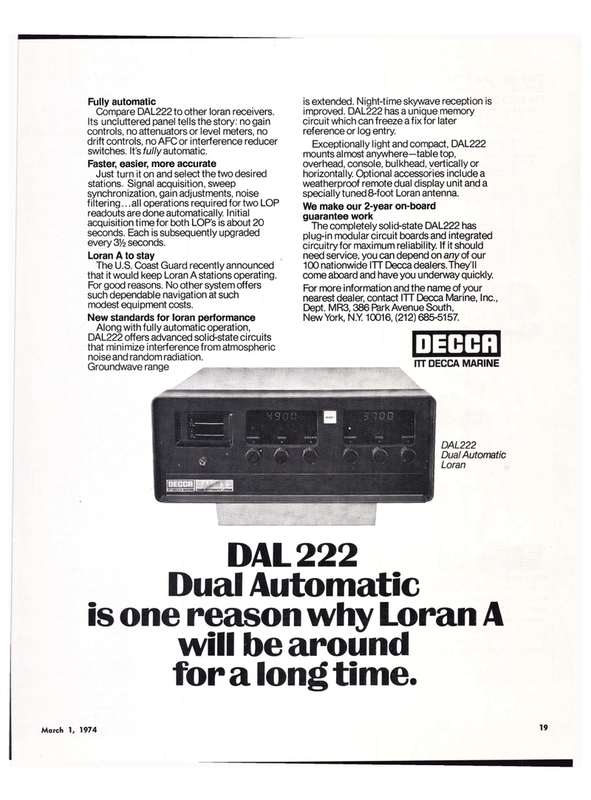 DAL 222 Dual Automatic is one reason why Loran A will be around for a long time. radiation U.S. Coast Guard ITT Decca Marine Inc.